All transactions are safe and secure with a reliable history in online purchasing behind each of our associates. 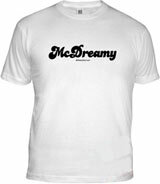 Buy the McDreamy t-shirt to own Grey's Anatomy clothing and merchandise. Dress your significant other in an attractive Dr. McDreamy t-shirt that will help to make your ultimate Grey's fantasies come true. Tell him that it's his turn to play doctor. The front of this tee features the name "McDreamy" printed across the chest in a dark cursive style font. Show off his mcmuscles with a fitted style tee (shown on the left), or purchase the design on a more relaxed type of apparel. Match this with a Dr. McDreamy Grey's Anatomy hat. In addition to the McDreamy tee above, browse the Grey's Anatomy Clothing Gallery for more apparel like men's and women's clothes, kids shirts or hoodies.